DIY L Bracket-03159, originally uploaded by sweetspot@f8. This is the DIY L-Plate I made for my Canon Rebel XS. For those who are not familiar with an L-Plate. 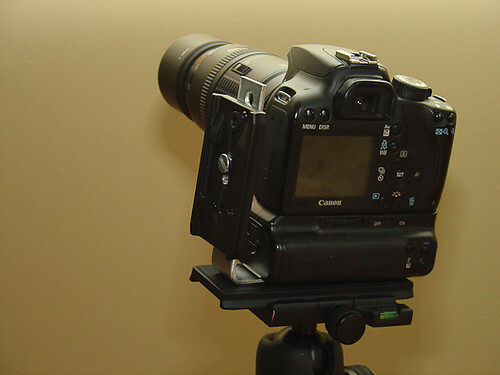 An L Plate will allow the photographer to mount the camera vertically. You can switch between horizontal and vertical without recomposing. Authentic L-Plates from the top manufacturers, costs around $120 to $199, I couldn’t see myself spending that much for an L-Bracket. My version of L-Bracket cost me less than $10.00, it may not be perfect but, it does the job and will probably fit most entry level dslr. Set of screw. You will use this to replace the existing screw on you tripod plates. It’s easy to make this kind of L-Plate, all you need to do is attached your two quick release plates on both sides of the Angle Bracket, like the one on the picture. Attached one end on the bottom of your camera and your done. This entry was posted in DIY Accessories and tagged in ballhead, diy, DIY Accessories, home, homemade, homemade l-plate, l-bracket, l-plate, l-plate t1i, l-plate xs, l-plate xsi, qs-45, qs-46, sbh-300, vanguard.